Summertime to-do list: #44 is done! Len and I are officially on vaycay at our house in F-L-A. I woke up at 5:15 to blow dry my hair so it would be freshly straight for my flight and at least a few days of my trip. I know this is a big nuts but it is very humid and I am not quite ready to deal with #50 (learn to embrace my Jew-fro) yet. Got to the airport by 6:30 for our 8:15 flight. Used my Nexus card for the first time and flew right through security and immigration. I felt a little like a rockstar. Soon after lift off, I unpacked and prepared the breakfast I'd packed for myself: a (mostly) fresh baguette, really runny brie, and blueberries. It was a lot les chic and whole lot more stink than I'd envisioned it would be. I officially became the stinky weird lady on the plane. All I was missing was a boiled egg and maybe some salami. Arrived in Florida at 11:15; exiting the planed felt like stepping into a really, really humid oven. So much for my gloriously straight hair. After stopping for a little lunch, we finally arrived at our place. I was tired and stinky and hot and ready for bed. Too bad it was only 1pm. We stepped inside, hoping for some relief from the heat and instead, we found it was even hotter. Our air conditioning was broken! Working together, my husband and I sprung into action: he called the repairman and opened the downstairs' windows while I went upstairs, turned on all of the ceiling fans and opened the windows in my daughter's room, my son's room, and our room. And then approximately bazillion of ants started pouring into my room! I am NOT exaggerating! Bazillions! Of! Ants! Apparently, during the rainy season in Florida, ants are everywhere and apparently, their home-base was the space between the screen and the glass in our bedroom window. I screamed bloody murder and my husband came running. Once again, we sprung into action: I slammed the window shut and he immediately started squishing the suckers as they furiously started to spread out all over the wall while I ran downstairs to get the ant killer. As soon as we (mostly) got it under control, he went out to get more ant killer while I vacuumed the rest of the ants that had found their way into our home and... did not live to tell there grandchildren about their travels. My husband returned, did his thing to the ant nest on the windowsill and then we were off: me to the grocery store and he to Brandsmart for a new dishwasher. Oh, did I forget to mention that in addition to the busted air condition and ant infestation, upon arrival we found a puddle of moldy water in the bottom of our completely busted dishwasher? Fun times. By early evening, things were a bit more under control: the dishwasher was ordered, the fridge was full, the air-con was fixed, and my husband shop-vacuumed the holocaust of ants in our bedroom.We sighed a sigh of relief and decided to go out for dinner. So while he showered, I did my internet research and found what was supposed to be West Palm's best Mexican Food. Driving there, we were a little wary of the 'hood, but we kept an open mind; we love hidden gems like this. This "hidden gem" was sandwiched in between a gun shop and a bar with an all-female staff. We hightailed it out of there and went to this other Mexican place Len had heard about. It turned out to be awesome. And cheap! Salsa, guac, fajitas, sangria, and one Mexican beer-all for $35 bucks! It rained harder than I thought was possible. 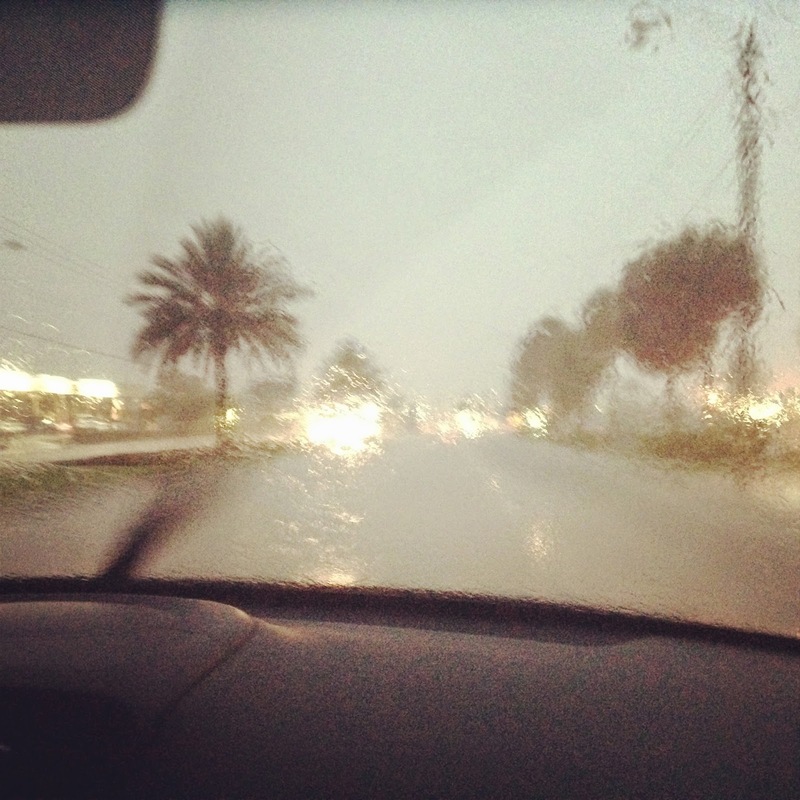 And not like 10 minutes of hard rain like you usually get in tropical climates. It just kept going and going and going. And don't even get me started on the thunder and lightning. But once again, my knight in shining armor white suede shoes saved me. He braved the storm, brought the car around front for me, and got me home safely. The night ended with me and my now giant, frizzy, curly hair chillaxing on the couch watching the Real Housewives of Somewhere. So much for sacrificing an extra hour of sleep for straight hair. Yes, despite the frizz and the ants and the air-con and the rain and the rest of it, it was a perfect day. Because even though we had very little sleep, we were faced with tons of unexpected challenges, and overall, did not have a smooth start to our vacation, when things (literally) got too hot, neither of us got out of the kitchen. We didn't yell or scream. Or blame or bicker. Or freak out or sulk. We worked together as a team. We supported each other. We took it all in stride and solved every problem. And we laughed about it all every step of the way. We've both been so busy with work and kids and life in general over the past few months that we haven't had time for each other and we both were really starting to feel it. We really needed this time together. If yesterday was any indication of the way the rest of this trip is gonna go, we're gonna have a great two weeks together. And a great life together. Forever. An ant infestation and a broken air conditioner are really not the things you want to discover after a long and hot day. Good thing the repairman was able to come in at once after your husband called, and was able to do the necessary repair. He certainly saved you from a hot situation! Have a good one!